Astounding statistics have recently been published by WRAP showing that 8.3 billion single-use plastic bags were given out in the UK in 2013 – an increase of 10 per cent since 2010. England had a shocking increase of 18 per cent while Wales and Northern Ireland, where charges are already in place, showed decreases of 79 per cent and 67 per cent, respectively. Across Europe, some eight billion plastic bags end up as litter every year. The UK Government has committed to introducing a 5p charge on carrier bags in England from October 1, 2015. However, the proposed exemptions for small businesses, paper and biodegradable bags mean that this scheme will be much less effective than those in Wales and Northern Ireland. 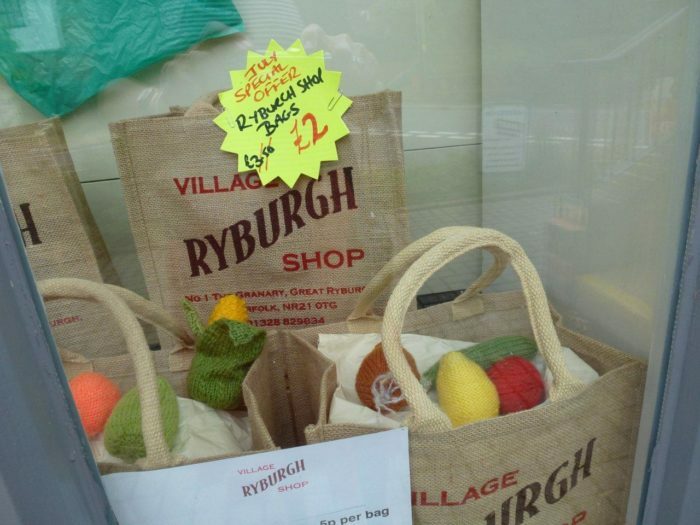 Great Ryburgh Village Community Shop, in the middle of rural Norfolk, has taken a simple unilateral step and dramatically reduced the number of plastic bags given to its customers. On July 1 this year, a 5p charge was introduced for single-use plastic bags and, at the same time, throughout the month its own durable and reusable jute bags went on special offer. The Shop Committee decided that introducing the charge could make a small but significant contribution to changing consumer habits and reducing the scourge of plastic bags on our environment. Signs were posted in the shop explaining why the charge had been introduced and the impact of plastic bags on the environment, noting that any profits from the scheme would be invested in the shop’s maintenance. The charge and its justification were posted on Twitter and Facebook, and accompanied by a press release. The response from customers has resulted in very little money being raised for the shop’s maintenance. In the first week just 10 bags were sold and on International Bag Free Day – highlighted by the shop – no bags were sold! Less than a month after the introduction of the charge, very few bags are sold now and the vast majority of customers are either bringing their own bags or carrying out their shopping in their hands, bag-free. Sales of the jute bags have increased. The World Cup window display has now been replaced by a ‘Say No to Single-Use Carriers’ display. I am very proud that my village shop at the heart of its community has demonstrated that it can change customer habits and make a real difference. EIA applauds the shop’s initiative and calls on other retailers to follow its lead. EIA also calls on the Government to ensure the bag charge legislation is applicable to all bags and all retailers. This simple step will reduce the annual £1 billion litter clean-up cost and, more importantly, prevent huge amounts of waste plastic from endangering wildlife and our precious environment.